Peter Prendergast was born in Abertridwr, a mining village in the Aber valley near Caerphilly in Glamorgan. His father was a Roman Catholic from Ireland who sought work as a coal miner in Maesteg in south Wales after the 1916 Easter Rising. His two older brothers attended the local grammar school, but he was sent to the local secondary modern, where his art teacher, Gomer Lewis, recognised his artistic talent. 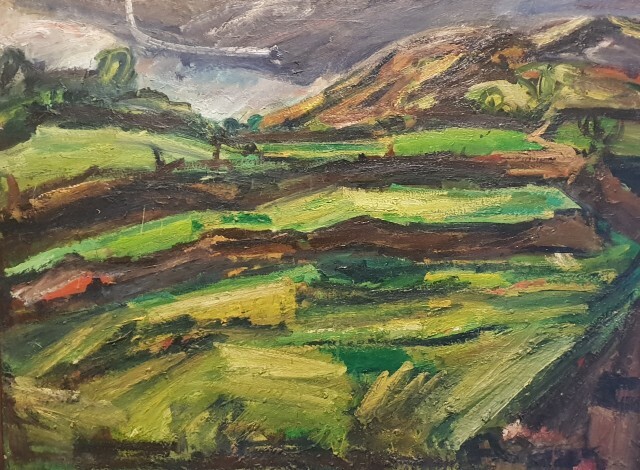 With support from the County art adviser, Leslie Moore, he won a County art scholarship to study at the Cardiff School of Art in 1962, despite having no formal academic qualifications. Musuem of Modern Art, Machynlleth; Boundary Gallery, London; Mostyn Gallery, Llandudno; Welsh Arts Council, Cardiff. Victoria and Albert Museum, London: Chosen as one of eleven artists to paint in one of the National Parks (Touring Exhibition. ).